[S1325] 1860 Blount Co., Ala. Census. [S1530] 1880 Alexander Co., N.C. Census. [S1450] 1870 Blount Co., Ala. Census. [S1526] 1850 Alexander Co., N.C. Census. [S1852] Alexander Co., N.C. Estate Files unknown file number. [S1192] Unknown subject, Civil War Service Records - North Carolina. [S1941] 1870 Butler Co., Ky. Census. [S449] Unknown volume, Kentucky Death Records 1852 - 1953, unknown repository. Birth*: Elijah Fortner was born in 1837 at Claiborne Co., TN. He was the son of Jonathan Forkner and Margaret Falls. Death*: Elijah Fortner died in 1864 at Atlanta, GA.
[S1735] 1870 Polk Co., Tenn. Census. [S200] Mona Forkner Paulas, The Forkner Clan Vol II. Birth*: Elisha Fortner was born on 12 February 1835 at Claiborne Co., TN. Marriage*: Elisha Fortner married Sarah Jane Day on 4 December 1858 at Claiborne Co., TN. 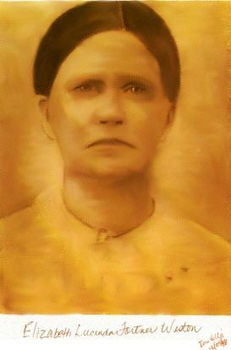 Death*: Elisha Fortner died on 5 June 1894 at Claiborne Co., TN, at age 59 . [S2314] 1850 Blount Co., Tenn. Census. [S1940] 1860 Butler Co., Ky. Census. [S1390] Unknown volume, Kentucky Marriages 1785 - 1979, unknown repository. Birth*: Eliza Jane Fortner was born in 1833 at Claiborne Co., TN. She was the daughter of Jonathan Forkner and Margaret Falls. [S200] Mona Forkner Paulas, The Forkner Clan Vol II, page 77. [S17] 1850 Greene Co., Tn. Census, pg 187. [S657] 1850 Blount Co., Ala. Census. [S1585] 1880 Greene Co., TN Census. Birth*: Elizabeth A. Fortner was born on 10 February 1824 at Greene Co., TN. She was the daughter of Jacob Fortner and Elizabeth Chambers. Marriage*: Elizabeth A. Fortner married Thomas Marshall on 15 June 1847. [S17] 1850 Greene Co., Tn. Census, pg 291a. [S1939] 1850 Butler Co., Ky. Census. Birth*: Emanuel Fortner was born circa 1804. [S1834] 1880 Blount Co., Ala. Census. Birth*: Etheldred Fortner was born circa 1777 at Warren Co., NC. [S1949] Unknown author, Tuggle Train Family. [S200] Mona Forkner Paulas, The Forkner Clan Vol II, pg 229. [S1326] Unknown volume, Alabama Marriage Collection 1800 - 1969, unknown repository.